The Winda School Program has been created to engage children and young people to develop an understanding of the importance of storytelling through film and media arts. It is also an opportunity to meet with aspiring role models in the arts from around the world. 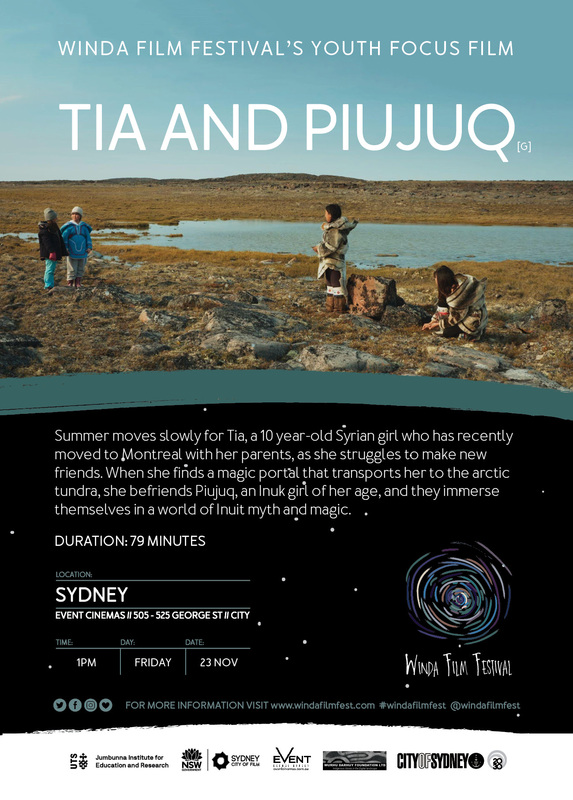 The special screening is a children’s feature film called Tia & Piujuq, an Inuit film based on a young Syrian refugee girl who finds a magic portal and travels to the Arctic where she befriends an Inuk girl with who she immerses herself in a world of Inuit myth and magic. We would like to offer complimentary tickets to students that are accompanied by school staff and/or parents to the screening on 1pm, Friday, 23 November. The film is perfect for young people aged between 9-13 years old and features the Inuktitut language. Directed by Lucy Tulugarjuk, a wellknown Inuit filmmaker and actress. If you know of a school that would be interested please email Medika Thorpe on medika@windafilmfest.com with the amount of tickets required, a contact name and phone number for ticket collection and a phone number by Friday, 16th November 2018.